Silicone bakeware has been popular for decades, but no product compares to the Pyramid Pan. It’s a textured baking mat featuring approximately 500 pyramids that elevate food above the cooking surface. The inventor wanted a product that would help him bake fish sticks that were crispy on the edges and moist on the inside. The design accomplishes these goals. If you’re interested in making healthier baked foods or improving the texture of your favorite frozen items, here’s what you should know about the Pyramid Pan. The Pyramid Pan’s unique design increases air circulation so that food cooks evenly. The peaks and valleys also channel excess fat and moisture away from the food to encourage even browning. In many Pyramid Pan reviews, customers said that barbeque ribs and chicken tenders cooked beautifully without flipping. French fries, spring rolls and pastries that are usually soggy and limp will come out crispy on all sides. The product even restores leftovers to their former glory and deliciousness. 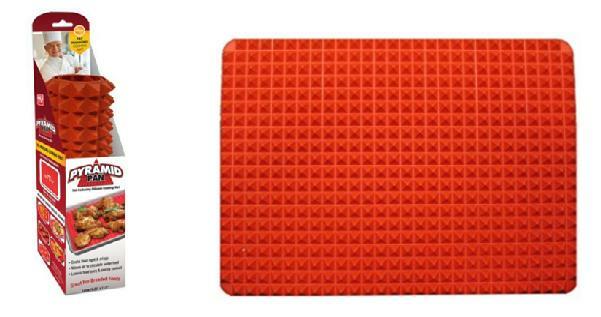 For example, pizza is one of the trickiest items to reheat, but this textured mat does a great job. The crust becomes wonderfully crisp without getting too dry. Silicone has many useful qualities in the kitchen. Nothing sticks to it. You can avoid hours of cleanup when you make toasted cheese sandwiches, candy, chocolate or caramel-covered treats. Unlike aluminum, silicone is non-reactive. Food-grade silicone is suitable for baking at temperatures as high as 425 degrees Fahrenheit or 220 Celsius. For safety, don’t exceed the recommended temperature or overheat the mat for an excessive length of time. Use this specially designed mat in the oven, microwave, refrigerator or freezer. The product covers a half-sheet pan, or you can trim it to fit your favorite baking trays. Use the Pyramid Pan to line your crock pot or multi-cooker. It prevents scorching and makes cleanup easier. This reusable mat is a fantastic alternative to aluminum foil and parchment paper. Protect surfaces from hot dishes by using the mat as a trivet. Thanks to the non-stick surface, it’s easy to make healthy meals without adding fat. If you’re baking frozen or fried items, any oil will drain away as the food cooks. Clean silicone products with hot water, or place them in the top rack of your dishwasher. This flexible mat rolls up for easy storage in a cabinet or drawer. Silicone baking mats are perfect for making many popular foods and snacks. There are plenty of alternative uses too. Customers who have posted Pyramid Pan reviews raved about the results that they had cooking these items. Chicken wings and breaded chicken breasts cook evenly and stay perfectly moist. Excess fat drains away from bacon and breakfast sausages. Eggrolls, taquitos and frozen appetizers are crispier and crunchier. Fish strips, fresh fillets and crab cakes cook quickly while developing a crispy exterior. Fries and potato wedges are creamy inside and golden brown on the outside. Vegetable fritters, sweet potato fries and baked chips come out crispy every time. The Pyramid Pan is affordable. Buy one for yourself and a few to give to your friends and family. If you aren’t sure whether it’s right for you, do more research before you make your decision. The best Pyramid Pan review will cover all of the features as well as tips for using the product in your kitchen. WordPress theme by Ryan Hellyer.